Over the past 12 months, property values in Brisbane have fallen by -6.6 percent for houses and units declined by -5.4 percent, underperforming the ten year average annual growth rates of 8.0 percent for houses and 7.0 percent for units. Although the combined capital cities began to record a strong rate of growth post GFC, Brisbane’s property market underperformed and has recorded limited growth in home values over the past five years. 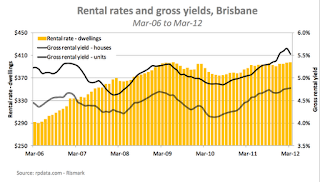 Brisbane’s property market also experienced distinct cycles over the past decade, with annual property value growth recording an historic high in November 2003, then consolidating over 2004 to 2006, followed by a strong recovery prior to the GFC however, Brisbane has been underperforming since 2008. Over the last five years, sales volumes have been recorded an average of 3,915 transactions per month. The current sales volumes are estimated to be -24 percent lower than the five year average. 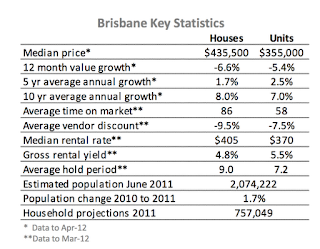 Brisbane’s median house price is recorded at $430,000 and the median unit price sits at $360,000 in April 2012. Compared to the combined capital city average, Brisbane’s property values have been underperforming since the beginning of 2009. Over the past five and ten years, Brisbane has experienced a much stronger housing market performance than it has over the past 12 months. Vendor discounting rates are currently recorded at an average of -9.5 percent for houses and -7.5 percent for units. At the same time last year, discount rates were recorded at -8.9 percent for houses and -7.8 percent for units. 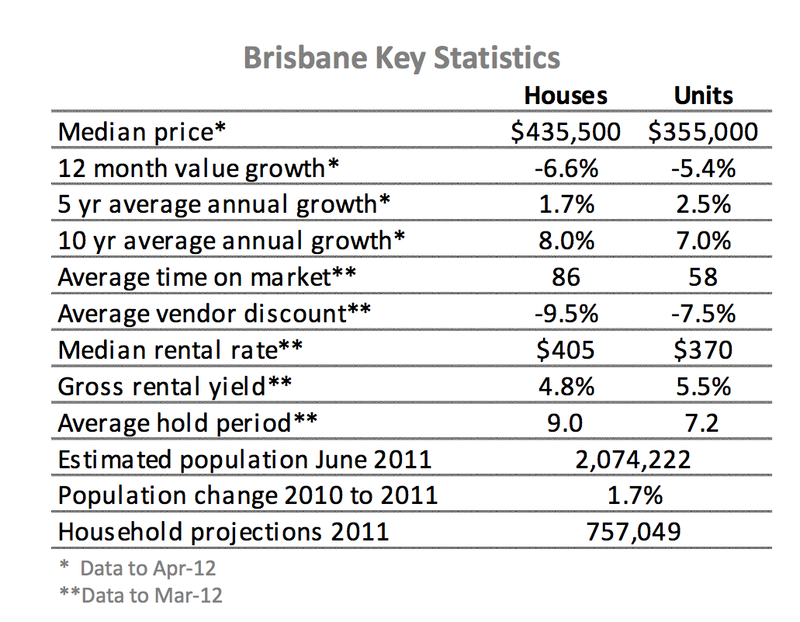 In March 2012, Brisbane houses were on the market for an average of 86 days and 58 days for units. In March 2011, houses took an average of 88 days to sell and units 66 days, highlighting a slight improvement in conditions for sellers. Vendors who sold their dwellings over the past year had owned their houses for 8.7 years on average and units for 6.9 years. 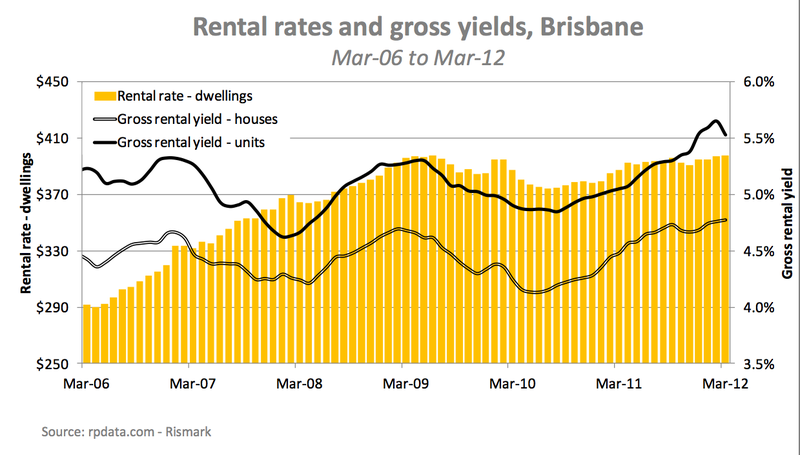 In June 2011, Brisbane’s estimated population was roughly 2.1 million persons, growing by 1.7 percent over the year. Brisbane dwelling are each home to an average of 2.7 persons.